Perched on a nunatak above the Don Sheldon Amphitheater, just 10 miles from the summit of Denali, the Sheldon Chalet is more than a place to stay - It’s an opportunity. “Experience Grand” at this exclusive destination on the flanks of North America’s highest mountain. EcoNest is the name we have given to our holistically designed and hand-crafted natural homes. 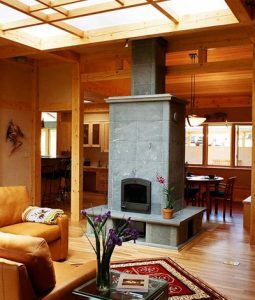 An EcoNest incorporates timber-frame, straw-clay walls, earth plasters and natural and non-toxic finishes. This combination of time-honored building traditions with modern innovations results in a home of unsurpassed health and comfort. This 2,325 square foot main house, 460 square foot guest house and detached garage are joined by a timber-framed breezeway. 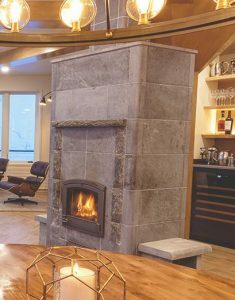 Ecological features include solar hot water heating, FSC-certified flooring, natural clay plaster finishes, extensive use of natural stone work, and hand-crafted formaldehyde-free cabinetry. The home was featured in the January 2009 issue of Natural Home magazine.